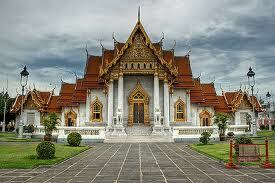 Trip Description : This tour combines two very popular Bangkok half-day tours. The excursion includes Wat Trimit, the temple of the Golden Buddha - the statue of Buddha is made from solid gold weighting 5.5 tons; Wat Pho, the temple of the Reclining Buddha - the largest and oldest in Bangkok and the Grand Palace including Wat Phra Kaew-Temple of the Emerald Buddha. Meet your private English-speaking guide in the hotel's lobby. Depart from hotel to Rattanakosin Island, the original area of Bangkok when it was first established as the capital over 200 years ago. Visit Wat Trimit, known for its famous Golden Buddha. The beautiful image of solid gold is three meters high and weighs five and a half tons. Continue the tour by passing through beautiful city scenery of the colorful flower market and Chinatown. The bustling business area of Chinatown is especially known for its gold jewelry shops. The atmosphere is totally changed at night - hordes of food stalls line the streets. Visit Wat Pho or Temple of the Reclining Buddha, founded in the 16th century, the oldest and biggest temple with the largest number of pagodas (95 in all) in the city. Wat Pho was the first open university of Thailand which offered courses in several branches of knowledge like literature, astrology, medicine and massage. It's well known for its huge Reclining Buddha, 46 m. long and 15 m. high. 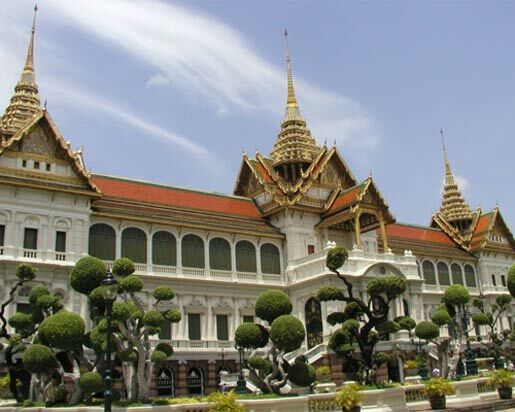 10.30 Visit The Grand Palace has an area of 218,400 sq. metres and is surrounded by walls built in 1782. The length of the four walls is 1,900 meters. Within these walls are situated government offices and the Chapel Royal of the Emerald Buddha besides the royal residences. Wat Phra Kaeo, the most beautiful and important Buddhist temple in Thailand. It is so richly and intricately decorated that, once entering the temple, you will feel as if you are in a real "city of angels". City-sightseeing tour along Ratchadumnoen Rd. (The Royal's Way). En route you can see many magnificent temples and architectural buildings, including the City Pillar Shrine, National Museum, Democracy Monument, Golden Mountain, Thai Boxing Stadium, Anantasamakhom Palace, Parliament House, Dusit Zoo and Chitlada Palace King's Residence. 14:30 hrs Arrive your hotel. Note: Time at mentioned is approximately can be change without notice depends on whether condition and traffic.